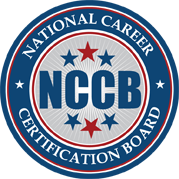 At the National Career Certification Board (NCCB) our goal is to provide entry-level certification for the career training industry. NCCB endeavors to assist professionals in enhancing and demonstrating their knowledge, skills, and professionalism. NCCB creates and conducts exams that lead to professional certification.